I know I've not been living very well recently. I'm rushing forward, straining towards the next thing. Unappreciative of the ordinary and the beautiful. Internally complaining about my situation and the people around me. Critical of pretty much everything. Thinking if this and that and the other we're different, then I'd be different, and that difference would make everything so very much better. Forgetting to stop and smell the coffee, or the flowers. Passing over the urge to take another photo of my child, and capture a moment that I know is so fleeting. Choosing to eat dinner quickly in the kitchen so I can get a head start on the cleaning instead of enjoy our family meal. Ignoring that all to rare feeling of creativity. The kind that births songs and other things. It's that feeling where the hair on my body kinda stands on ends, there's a stillness in the chaos, and my heart beats funny. It's that place in between this and that where new things are born. And I'm just passing it up for the great pleasure of vegetating in front of the box. Again. And the thing is I know, whilst I'm doing it that I'm just not living right. I really do know better. Since writing the above, my granny sadly passed on from this life. More on this in another post I'm sure, but one of the obvious side effects of loosing one of your most cherished human beings is that one inevitably receives an acute sense of ones own mortality as well as the unstoppable passing of time. So I'm living life abit better now. I'm cherishing moments again. Well not as fully as that statement implies, but I am buying up my opportunities and making better use of my time, well a lot more of it, and it feels good. In other news, I've ventured into songwriting for others again and it's been soooo fun! In the past I've always found this to be a struggle. The pressure of having to come up with something, and having to write with other people, erghh. I write all of my own music alone, and that's the way I like it. Writing with others has previously proved quite incapacitating and unenjoyable, however it seems to be different now. I've been writing with a great team, and whilst we were given the task of writing an album in a few weeks, it was really easy! Things just flowed. Yeaaahh. 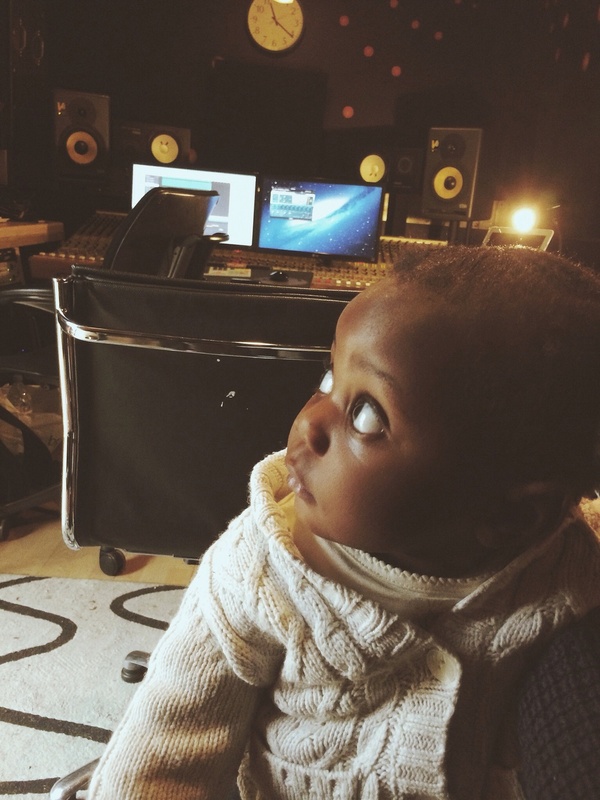 And the most amazing thing ever was that I could take Ava into the studio with me! And she was fab...most of the time, providing lots of light relief, thanks honeykins! I find trying to live authentically much like this. Some days I hit it dead on. Most days I slip into the alternative: Fitting in. Imitation. Impoverished thinking. Etc. Ultimately some of us cannot help but continue on. The unveiling is too darn irresistible. You can't help it if you're a prisoner of hope. You can't help it if you believe in what you might find.